Thirty years ago, Vietnamese soldiers waged a final, furious battle in the hills of Lang Son near the country’s northern border to push back enemy troops. Both sides suffered horrific losses, but Vietnam eventually proclaimed victory. Decades later, diplomatic relations have been restored and the two nations, at least in public, call each other friend. Vietnam’s former foe is a major investor in the country, bilateral trade is at an all-time high, and tourists, not troops, are pouring in. The latest lightning rod for anti-Chinese sentiment is Hanoi’s plan to allow subsidiaries of the Aluminum Corporation of China (Chinalco) to mine bauxite ore in Vietnam’s Central Highlands. Bauxite is a key ingredient in aluminum, which China needs to fuel its construction industry. Vietnam has an estimated eight billion tons of high-quality bauxite, the third-largest reserves in the world. The environmental cost of extracting the mineral, however, can be high. Strip mining is efficient, but scars the land and bauxite processing releases a toxic red sludge that can seep into water supplies if not adequately contained. Several senior Vietnamese scientists as well as Vietnam’s burgeoning green movement have questioned the wisdom of giving mining rights to China, whose own mines were shut down because of the massive damage they caused to the environment. But the real opposition appears to have less to do with the environment and more to do with Vietnam’s fear of its neighbor on the country’s northern border. Nationalist groups accuse Hanoi of caving in to pressure from commodities-hungry China by allowing the mining project to go forward. Bloggers are whipping up fears that the influx of Chinese workers is part of Beijing’s long-term strategy to occupy their country. Banned pro-democracy groups, which are happy for any opportunity to criticize the authoritarian government, call the mining venture an “ill-begotten scheme.” Earlier this month, a dissident Buddhist monk, Thich Quang Do, said that strip mining will destroy the way of life of the region’s ethnic minorities. He added that the project created “an illustration of Vietnam’s dependence on China.” There has been no such outcry against U.S. aluminum giant Alcoa’s plans to mine two sites in Dak Nong province in the Central Highlands. Perhaps the most unexpected criticism has come from General Vo Nguyen Giap, a revered Vietnamese military leader who helped defeat the French and later the Americans. In a letter to Vietnam’s Prime Minister Nguyen Tan Dung, the 97-year-old war hero voiced concern over the presence of large numbers of Chinese in the Central Highlands, which is a strategic gateway to Vietnam, one where battles have been won and lost. Other countries in the region are made uneasy by China’s thirst for resources. Last month, the Australian government rejected a $1.8 billion bid by Chinese mining company Minmetals to acquire debt-ridden OZ Minerals, the world’s second-biggest zinc miner, due to national security concerns. OZ Minerals has operations near Australia’s Woomera weapons testing site. The Hanoi government says it is listening to concerns but it appears to be unmoved. Dung recently declared bauxite mining a “major policy of the party and the state.” Deputy Prime Minister Hoang Trung Hai reaffirmed the government’s support, and several local provincial officials were on hand at a recent mining conference to defend the project, arguing that despite the presence of the Chinese workers, development will benefit the impoverished ethnic minorities who live in the region. 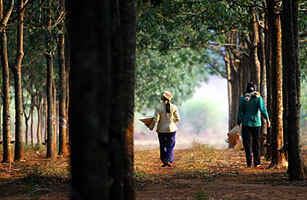 Some of the problems are of Vietnam’s own making, observes Thayer. The country has become increasingly dependent on foreign direct investment to buoy its economy. Last year, overseas investors sunk a record $11.5 billion into Vietnam. China last year had 73 investment projects worth $334 million in the country. But in the wake of the global recession, foreign direct investment plummeted 70% in the first quarter of 2009 compared to the same time period last year. Hanoi has been calling for increased investment, and is even more desperate for external cash infusions now that its economy has flatlined. Vietnam has also racked up a massive trade deficit with China. As more Chinese companies venture across the border and sink millions into new investment projects, Hanoi can’t dictate all the terms. Nor can they just close the spigot. “The Vietnamese have to be careful of what they wish for,” says Thayer.